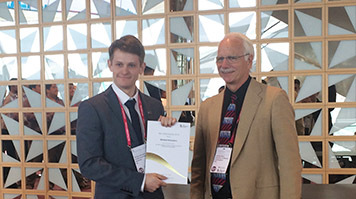 London South Bank University (LSBU) recent Sport and Exercise Science undergraduate, Michael Attwaters, has won a Gold Certificate for Achievement in research at this year’s Joint Meeting of The Physiological Society and the American Physiological Society in Dublin, Ireland. In 2015, as a second year student at LSBU, Michael won a highly competitive vacation studentship from The Physiological Society to conduct a research project during the summer break entitled: ‘The effects of age on centre of pressure (COP) progression characteristics during walking’. The investigations took place at LSBU’s state-of-the-art Sport Science Laboratory and set out to understand when age-related differences in walking mechanics begin. The research, started by LSBU’s alumni Tamara Ebi-George for her final year project, and strengthened by Michael’s involvement, recruited 147 volunteers aged between 18 and 84 with the help from local charity Silverfit. Each participant was asked to walk over a 2m pressure platform and their respective foot roll-over pattern was measured. The tests found that walking mechanics start to exhibit significant changes at an age as early as 30 years old. These findings highlight the need for engaging in physical activity and exercise for muscle strengthening and balance, much earlier than previously thought, to prevent development of gait deficits with advancing age. Michael’s report on the project was awarded with the Rob Clarke Abstract Award, which recognises the research work carried out by undergraduate students, and entered into the competition with other nominated undergraduate projects from across the UK and the United States for the Gold Certificate of Achievement. At the meeting in Dublin each of the 19 students exhibited a poster presenting their project and defended their work orally to a scientific panel of leading physiologists. Find out more about LSBU’s Health and Wellbeing Institute.